The church is meant to be a place where sinners find Jesus and learn to love each other in unity on a journey toward become saints. Unfortunately, the church remains filled with sinners who often devolve toward infighting and arrogance. Those who grow up confused by the disparity between what is taught and what is lived out can be tempted to leave all of Christianity behind. Although my church past is not as horrifying as Yancey’s, I still struggle to reconcile the strains of legalism and divisiveness that I was taught alongside grace and love. Reading Soul Survivor was like taking a gulp of fresh air as I was encouraged to leave the bad behind and cling only to the good. Yancey’s spiritual growth largely came from looking outside of the church to social reform leaders and literary geniuses. As a soft-hearted bibliophile, I was utterly won over by his thirteen spiritual directors. Much like the men and women described in the Bible, the people who most affected Yancey are complicated people who pursued the difficult life of forgiveness and reconciliation while also committing affairs and battling depression. They are not perfect people, but they wrestled with God. Unwilling to accept easy answers or the status quo, the people who fill Soul Survivor‘s pages are so inspiring. I’m so grateful to Philip Yancey for his honest recollection of his past as well as his offering of spiritual giants to learn from and emulate. How did Yancey manage to survive spiritually despite early encounters with a racist, legalistic church that he now views as almost cultic? In this, his most soul-searching book yet, he probes that very question. He tells the story of his own struggle to reclaim belief, interwoven with inspiring portraits of notable people from all walks of life, whom he calls his spiritual directors. 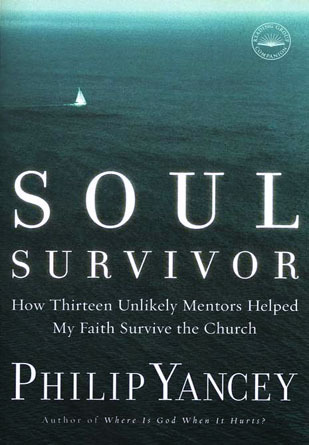 Soul Survivor is his tribute to thirteen remarkable individuals, mentors who transformed his life and work. Besides recalling their effect on him, Yancey also provides fresh glimpses of the lives and faith journeys of each one. From the scatterbrained journalist G. K. Chesterton to the tortured novelists Tolstoy and Dostoevsky to contemporaries such as Martin Luther King, Jr., Annie Dillard, and Robert Coles, Yancey gives inspiring portraits of those who modeled for him a life-enhancing rather than a life-constricting faith. Next Article Why Do Good Girls Like Bad Boys?